On Tuesday, hours before Indian Prime Minister Narendra Modi claimed on a TV channel that demonetisation boosted the economy, and described the performance of the BJP government at the Centre as outstanding, a leader of the Opposition Congress party, Kapil Sibal, held a press conference in Delhi. Sibal showed video footage of money laundering to the tune of hundreds of billions of rupees by the henchmen of the ruling party in the context of demonetisation. With the first phase of the seven-part general elections on, it is now clear this is going to be one of the most bruising elections ever. The manifestos that the Congress and the BJP have released vied in populistic appeal. The Congress’s basic story is a minimum income guarantee for 20 per cent of India’s poorest. The BJP, in addition to the promises of pumping in money to the rural sector and a better deal for the eternally victimised and angry farmers, has played on the themes of national security and the possibility of removing Article 370 that relates to special status of Jammu and Kashmir (J&K). The BJP manifesto gives the impression of a defensive document. Congress president Rahul Gandhi and his think tank seem to have wrested the initiative in terms of imagination if their manifesto is any indication. But after Tuesday’s revelation by Sibal and the apparently incriminating video footage that he screened to a seemingly stunned media, the elections are likely to be fought not so much on the strength of the tall promises the parties have made as the subversion of Modi’s personal image as the self-styled chowkidar (guard) of the Indian poor. Sibal directly implicated the BJP strongman and party president, Amit Shah. Since Shah is Modi’s closest associate, it would be difficult for the prime minister to escape guilt. Almost overnight, the complexion of the game seems to have changed drastically. It is possible in retrospect that the new-found confidence and aggression that Rahul has displayed has its source in the latest disclosures. It seems logical to infer that Rahul was waiting for the right time in ‘exposing’ the prime minister. As it is, a spate of surveys last week have shown that the BJP is destined to lose out in the South, especially in Kerala, Andhra Pradesh, Telangana and Tamil Nadu. Karnataka might end up giving them a few seats. In the north, big states such as Uttar Pradesh (UP), Madhya Pradesh and Rajasthan are poised to swing the other way. In UP, even if the Congress does not win a majority of the seats, the alliance of Mayawati and Akhilesh Yadav will carve out a large size of the pie. That leaves the BJP with Bihar and the Northeast. Even if they get most of the seats there, which is doubtful, the BJP may not cross 180. In the 543-seat parliament, this is just not good enough, given Modi’s rather authoritative style of functioning. What this means is rather simple. If the BJP would somehow want to cling on to power, it would have to make painful adjustments to regional/splinter parties. If so, Modi must be demonstrably more democratic. This is not likely. The only alternative is to arrive at another BJP candidate as prime minister. This is not easy as the party has been so far promoting the cult of Modi to the exclusion of all other personalities. My bet is that the Congress may pull off what until recently was considered impossible. It may come to power. How Rahul will weave the several threads — for the Congress too will have to depend on smaller parties — into a binding rope remains to be seen. But, since the second half of last year, Rahul has shown that he is capable of dare. Indeed, he has shown he can visibly grow in stature. As mentioned earlier, this election no longer kowtows to any civility. 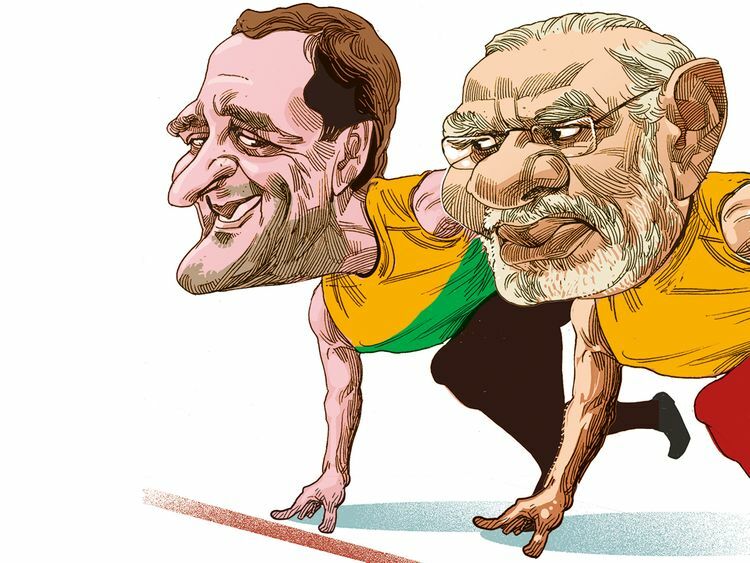 In the next few weeks, India and the world will see an all-out duel as the world’s largest democracy goes to the polls. All one can hope is that the ballots don’t bleed. These are desperate times. Democracy itself could be an excuse for despair. I have my fears, but I better keep them to myself. C.P. Surendran is a senior journalist and columnist based in India.